Whether you’re behind the wheel of a car or are a car passenger, the moment you get on the freeway lane in Los Angeles – you’re a potential target of the deadly chain-reaction car accidents. You see, you may obey all traffic rules and drive safely, but you’re sharing the freeway with thousands of Los Angeles car drivers. And there are cars everywhere: both in front and behind you. Imagine if a car in front of you stops abruptly, causing your car to slam into it. Your airbag may have deflated, but your car is most likely going to be hit from behind as well. Would you or any of your passengers survive such a chain-reaction car crash? 7. the driver of the white truck was hospitalized in critical condition. Such chain-reaction car accidents are not uncommon in Los Angeles or elsewhere in our country. In fact, chain reaction car crashes account for about 15% of all traffic-related fatalities in the U.S.
That’s about 13,000 fatalities every year. Most chain-reaction collisions occur on freeways, where cars are traveling at a high speed and there are so many cars that it can be practically impossible to react to a car in front of you stopping abruptly. Determining fault in a chain-reaction car accident and litigating such crashes may be a daunting task if you aren’t represented by a car accident attorney. In chain-reaction collisions, even if you clearly weren’t at fault, you may be liable for the injuries, fatalities and vehicles damages of other drivers and their passengers if other drivers – who are most likely represented by experienced lawyers – put the blame on you. That’s the danger of such car accidents, as establishing the chain of events leading up to a chain-reaction car crash may be difficult (which means victims may be blamed for something they had no control over). 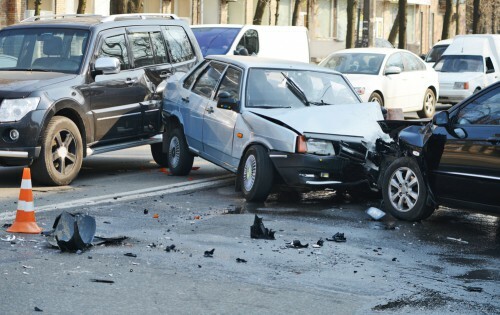 How to determine liability in chain-reaction car accidents? Your best line of defense in chain-reaction car accidents is to seek the legal advice of a Los Angeles car accident attorney, gather witness accounts and find sufficient evidence to prove other drivers’ liability and negligence. You can prove someone else’s negligence in chain-reaction car accidents by establishing that the other driver failed to maintain a safe following distance between the vehicles, or that he was seen using his phone at the time of the car crash (an experienced attorney may help you prove it by investigating into the driver’s phone records in case of fatal car crashes), or other factors. To help you navigate each step of an insurance claim and prove the other drivers’ negligence in a chain-reaction car accident, consult an experienced car accident attorney in Los Angeles from a reputable law firm. One such law firm is JML Law, which has had a successful record of navigating car accident cases and helping their clients get compensation for their injuries, losses and damages in Los Angeles and all across California. Call JML Law’s Los Angeles offices at 818-610-8800 or send an email to schedule a free initial consultation.